Margot Livesey presents "The Hidden Machinery"
Please join us on Sunday, October 22 at 3pm, when Margot Livesey presents her new collection of essays, The Hidden Machinery. The event is free and open to the public; there will be time for Q&A and book signing after her talk. Join Nan Cuba and Margot Livesey as they celebrate Cuba's debut novel, Body and Bread, one of "Ten Titles to Pick Up Now" in O Magazine and "15 New Books for Your Beach Bag" in the Huffington Post. Cuba unearths the power of family legacies and the indelible imprint of loss on all our lives. Years after her brother Sam’s suicide, Sarah Pelton remains unable to fully occupy her world without him. As she assembles the artifacts of her family’s history in East Texas in the hope of discovering her own future, images from her work as an anthropologist — images of sacrifice, ritual, and rebirth — haunt her waking dreams. Nan will read an excerpt from the book and then engage in a conversation with Margot. Nan Cuba received her MFA in fiction from the Warren Wilson Program for Writers, is the founder and executive director emeritus of Gemini Ink, a nonprofit literary center, was twice the runner-up for the Dobie Paisano Fellowship, and received a Fundación Valparaiso Residency Grant in Mojácar, Spain. She is currently an associate professor of English at Our Lady of the Lake University. As an investigative journalist, she reported on the causes of extraordinary violence in publications such as LIFE and D Magazine. Her stories, poems, and reviews have appeared in Quarterly West,Columbia: A Magazine of Poetry & Prose (runner-up for the journal’s fiction award), the Bloomsbury Review, and the Harvard Review, among others. She is coeditor of Art at Our Doorstep: San Antonio Writers & Artists. Margot Livesey's acclaimed novels include The Flight of Gemma Hardy, The House on Fortune Street (winner of the L. L. Winship/PEN New England Award) and EVA Moves the Furniture. She lives in the Boston area and is a Distinguished Writer-in-Residence at Emerson College. This small but welcoming group will discuss The Flight of Gemma Hardy by Margot Livesey. Come add to the fun! The Northshire Women Read group will meet at the Inn at Manchester on Monday, February 11th to discuss, The Flight of Gemma Hardy, by Margo Livesey. Our reading group is now filled with enthusiastic readers, but we would love to invite you to join us at a later date. Please email Nancy, nscheemaker@northshire.com, to join a waiting list. This month's book is The House on Fortune Street by Margot Livesey. The Flight of Gemma Hardy, is an inventive reimagining of the Jane Eyre story. Set in mid-twentieth century Scotland, Livesey’s atmospheric homage to Brontë’s literary masterpiece traces the misfortunes and misadventures of a strong-willed orphan girl who finally comes into her own. Margot Livesey is the acclaimed author of the novels The House on Fortune Street, Homework,Criminals, The Missing World, EVA Moves the Furniture, and Banishing Verona. Her fiction has appeared in The New Yorker and The Atlantic Monthly, and she is the recipient of grants from both the National Endowment for the Arts and the Guggenheim Foundation. Born in Scotland, Livesey currently lives in the Boston area and is a writer in residence at Emerson College. Bestselling author Margot Livesey will speak about her latest novel, the modern day journey of a young woman loosely based on the story of Jane Eyre, The Flight of Gemma Hardy. Margot Livesey is the acclaimed author of the novels The House on Fortune Street, Homework, Criminals, The Missing World, Eva Moves the Furniture and Banishing Verona. Her fiction has appeared in The New Yorker and The Atlantic Monthly, and she is the recipient of grants from both the National Endowment for the Arts and the Guggenheim Foundation. The House on Fortune Street won the 2009 L.L. Winship/PEN New England Award. Livesey was born in Scotland and grew up on the edge of the Highlands. She currently lives in the Boston area and is a distinguished writer-in-residence at Emerson College. In her new novel, acclaimed writer Margot Livesey reimagines the story of Jane Eyre. Set in remote Scotland in the mid-twentieth century, The Flight of Gemma Hardy (HarperCollins), traces the misfortunes and misadventures of a strong-willed orphan girl who finally comes into her own. Livesey, author of six previous novels, including 2009 L. L. Winship/PEN New England Award–winning The House on Fortune Street, is the recipient of grants from the National Endowment for the Arts and the Guggenheim Foundation. Margot Livesey and "The Flight of Gemma Hardy"
margot livesey reads from The Flight of Gemma Hardy. The Flight of Gemma Hardy is a captivating tale, set in Scotland in the early 1960s, that is both an homage to and a modern variation on the enduring classic Jane Eyre. Fate has not been kind to Gemma Hardy. Orphaned by the age of ten, neglected by a bitter and cruel aunt, sent to a boarding school where she is both servant and student, young Gemma seems destined for a life of hardship and loneliness. Yet her bright spirit burns strong. Fiercely intelligent, singularly determined, Gemma overcomes each challenge and setback, growing stronger and more certain of her path. Now an independent young woman with dreams of the future, she accepts a position as an au pair on the remote and beautiful Orkney Islands. But Gemma’s biggest trial is about to begin . . . a journey of passion and betrayal, secrets and lies, redemption and discovery, that will lead her to a life she’s never dreamed of. Margot Livesey grew up in a boys’ private school in the Scottish Highlands where her father taught, and her mother, Eva, was the school nurse. After taking a B.A. in English and philosophy at the University of York in England she spent most of her twenties working in shops and restaurants and learning to write. Her most recent novels include Eva Moves the Furniture, Banishing Verona and The House on Fortune Street. We are delighted to have Margot back at the Andover Bookstore, and excited to hear her read from the book Amy Bloom has called "a garden of pleasures: precision here, lyricism there, wit and compassionate insight throughout." Join us! 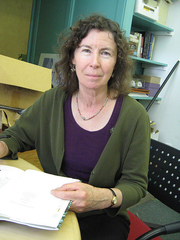 Margot Livesey is currently considered a "single author." If one or more works are by a distinct, homonymous authors, go ahead and split the author. Margot Livesey is composed of 4 names. You can examine and separate out names.